My name is Jacob Dockery. I’m a son, a brother, an uncle, a business owner and a father to my dog Wyatt. I’m 22 years old and I started a company in 2018 called MidWest Tees from the ground up, with a little guidance. We sell Bella Canvas tees with graphics starting at $ 12.99, tailored to boutique owners and wholesale. We had 235 members in April of 2018 and by the end of December, we hit 4,075 members. How did it feel the first day you opened? I was filled with excitement, I was stoked, I was thrilled, but I was really scared. I went from a steady job where I was about to get a promotion and a raise to not knowing when I was going to start making money. I didn't know if I was going to fail and what I would do if this didn't succeed. But in the first hour, I sold something. It may have been to my mother, but a sale is a sale! Go to your local bank — if anyone will listen to you, it will be them. They know you and they know your business. If they don’t lend you money, just start saving every penny until you can start investing in products. Start making friends in your industry, discuss your opportunity with them and see what they would charge you. It means a lot of different things to me. It means staying up until one o’clock in the morning building your company in the first three weeks, working on designs and strategizing on your next move. Business is chess, not checkers. An entrepreneur is always looking for the best way to make money in the most efficient way possible. You always have to been thinking forward to next season, next year. My toughest challenge had to be the Christmas season, which for retailers starts in September and ends the second week of December. We did about $ 147,000 during that time. For a company that just started in March, that is insane! We had a high volume of tees we had to get out and delivered within seven days. We got to work at 8 a.m. and left at 7 or 8 p.m. every day just to catch up. 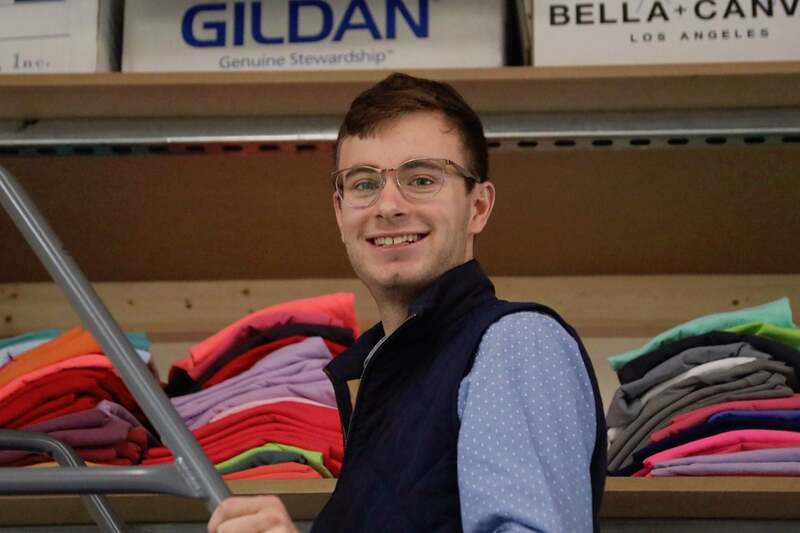 To solve our production problem, we bought another Brother GTX garment printer and hired another person to print and a couple more employees to pull orders. We stayed late every night and worked every weekend, and eventually got caught up and made a ton of customers super excited. So just keep hustling and don’t stop! One particular quote I live every day by has to be, "You will face your greatest opposition when you are closest to your biggest miracle," written by author Shannon L. Alder. It makes me strive to never give up, even if I think it’s going to be a bad design or a bad pitch. It reminds me to take a step back, reevaluate the problem and create a new point of attack. Never stop believing in your business or your product, because once you lose your focus or passion you cannot easily get it back. You have to love what you do because as an entrepreneur, you will work on this business every minute of every day.